Bulla is a small township with rural surrounds, immediately north-west of the Melbourne Airport, Tullamarine, and 25 km north-west of central Melbourne. The township is on Deep Creek, a tributary of the Maribyrnong River, and the creek has carved a sinuous course through a valleyed landscape. An early settler in the Bulla township area was William ‘Tulip’ Wright, former Chief Constable of the Melbourne township. He built the ‘Settlers Home’, later the ‘Bridge Inn’ near Deep Creek in 1843. In the same year the ‘Woodlands’ homestead was built by William Greene, to the east in Greenvale. It is on the Victorian Heritage Register, along with stables and outbuildings, situated in the Gellibrand Hill Park. The Bulla village was surveyed in 1851. The name is derived from an Aboriginal word of uncertain meaning. A church and a government school were opened in 1854. Anglican and Presbyterian churches were opened in 1858, and are on the Register of the National Estate. The township also had a store and post office (1850), a flour mill, brickworks and pottery works based on the local kaolin reserves. In 1857 Walter Clark built a Classical Revival homestead, Glenara, south of the township. His son Alister was founder of the Moonee Valley Racing Club and was a noted rose breeder. Alister Clark roses were nearly lost to horticulturists during the postwar years, but rose growers have found them in out-of-the-way country places and reintroduced them for rose collectors. Glenara is also on the Register of the National Estate. The Bulla Road District (1862) was proclaimed a shire on 9 March 1866. Its boundaries extended only as far east as Woodlands, but north-west to Sunbury, which became the rival township. 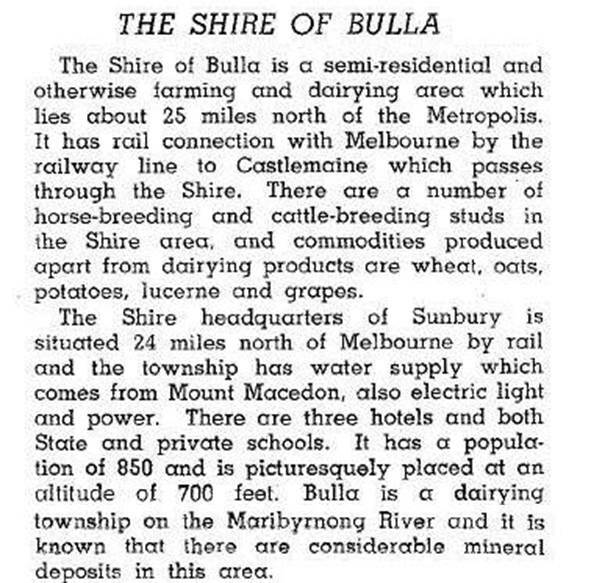 The shire offices were transferred from Bulla to Sunbury in 1956. Whilst the township is in a valley the surrounding land was suitable for dairying. The name was given to the Bulla Cream Co, a dairy (1910) in Moonee Ponds, and later to Bulla Ice Cream, to be found in most Melbourne supermarkets. Passing motorists cannot fail to notice the narrow heritage listed bluestone bridge (1869) at the bottom of the steep road through the township. A short distance away from the bridge is School Lane, the access way to the bluestone State School (1870). Beyond the school there was a suspension bridge (1872) over Deep Creek, with tracks fanning out from it over the hillsides, along which children journeyed on foot for over 100 years. The Bulla reserve has a community centre and sports facilities. The remainder of the township has St Mary's Anglican church, the general store and some houses. The Presbyterian (now Uniting) church and the cemetery are further east, near Woodlands and the flight path for the Melbourne Airport. In 1955 the shire's boundaries were enlarged by absorbing Cragieburn, Greenvale, Mickleham and Yuroke from Broadmeadows shire. The shire had acquired another rival to the Bulla township, Cragieburn on the Hume Highway. On 15 December 1994, most of Bulla Shire was united with most of Broadmeadows city and parts of Keilor and Whittlesea cities to form Hume city. In 1996 the Bulla primary school was closed amidst much local dismay and subsequently acquired by the Sunbury Christian community school.